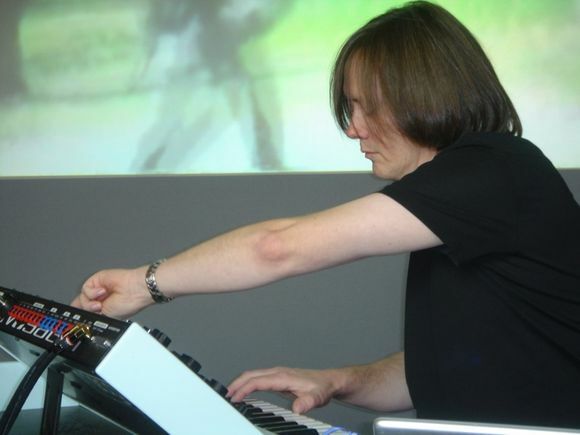 Roger O’Donnell helms his Moog at the Apple Store. Photo: Lee Sherman. Sometimes limitations can lead to the purest forms of self-expression. That’s what Roger O’Donnell found. After years of access to unlimited resources with The Cure, he decided to record an entire album, “The Truth In Me,” with but a single Moog Voyager synth. I caught up with O’Donnell at a recent Apple Store appearance in San Francisco, where he was amazingly candid about his compositional and recording process (which in fact is one and the same). His live setup was suitably minimal, a pair of Voyagers (one was just a backup), a newly acquired Little Phatty (there for show), a Motu UltraLite audio interface, a Faderfox controller, and a Mac laptop running Apple Logic and Ableton Live. The idea began with his haunting “Another Year Away,” on the soundtrack to the Moog movie. The track’s layered instrumental, made entirely of Voyager parts, worked so well he decided to do the whole album in the same way. His compositional process was old-school: he eschewed presets, preferring to program all sounds himself. The sounds suggested parts, which he played live and then looped so that he could improvise new parts on top of the old ones. None of the sounds were sequenced and nothing was quantized. He didn’t even bother to learn his parts before laying them down; everything was improvised. Sometimes this lead to interesting accidents, like when he’d play the same thing slightly differently resulting in a subtly different part. These differences are what give the music an organic quality not normally associated with electronica. Even effects were kept to a smattering of reverb and delay and a wah-wah pedal or moogerfooger here and there. O’Donnell’s lead work is simple but lyrical. Rather than becoming a hindrance, the monophonic nature of the instrument lends itself to a fluid sound that at times sounds more like a guitarist stretching out than a keyboardist. A few songs, notably the single “Treasure,” feature the guest vocals of Erin Lang. In keeping with the DIY nature of the project, Lang not only sings the song, she stars in and directed and edited the video. O’Donnell himself served as director of photography. O’Donnell is a brave man. Not only is the magician willing to show you how he does his tricks, he’ll also share his loops (“just email me”) and he recorded an entirely new improvised composition on the day I saw him. If you had to limit yourself to a single instrument, which one would it be?